Not too long ago, we poured over some really interesting maps about aging trends in the United States. Those maps showed county-by-county trends, and essentially brought us to the conclusion that we are slowly aging as a country, especially in Florida, and less-so in the Mountain West. But how do we stack up against the rest of the world? The answer says a lot about where we’re going as a country. Here’s the median age in each state as of 2010. Just like before, the trends are obvious. 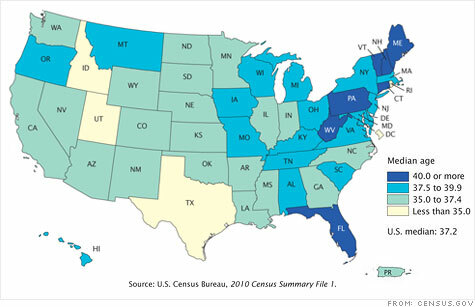 Older, more developed Northeastern states are more aged, the rugged, relatively unpopulated Mountain West is younger, and New England, Pennsylvania and Florida are the oldest areas in the country. Let’s parse this down further, and look at a big county-by-county map. It’s very interesting to see it this way. The county maps from last time showed trends into the future, this map shows the age of each county right now. It’s very unexpected that Maine is the overall oldest state by median age, though! But less surprising is the presence of the country’s oldest county, Sumter County, in Florida. It doesn’t take a rocket scientist to see where the shift is occurring there. The more “developed” countries are getting older, while the less “developed” countries are getting younger as their populations explode. The reasons are pretty easy to guess: easy access to birth control in the “Developed World” alongside far greater longevity and more comprehensive healthcare services in those countries letting more people live longer. 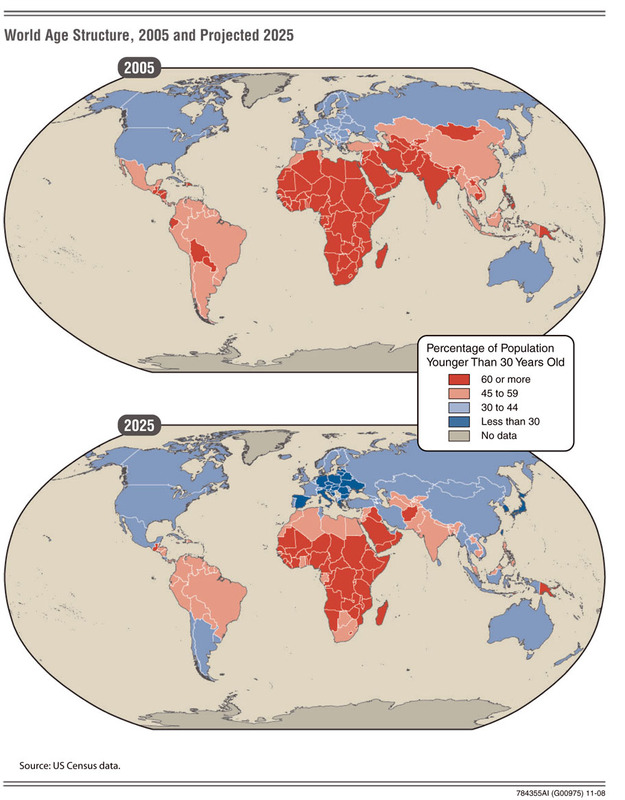 The areas of the world that are healthiest are understandably becoming the oldest! 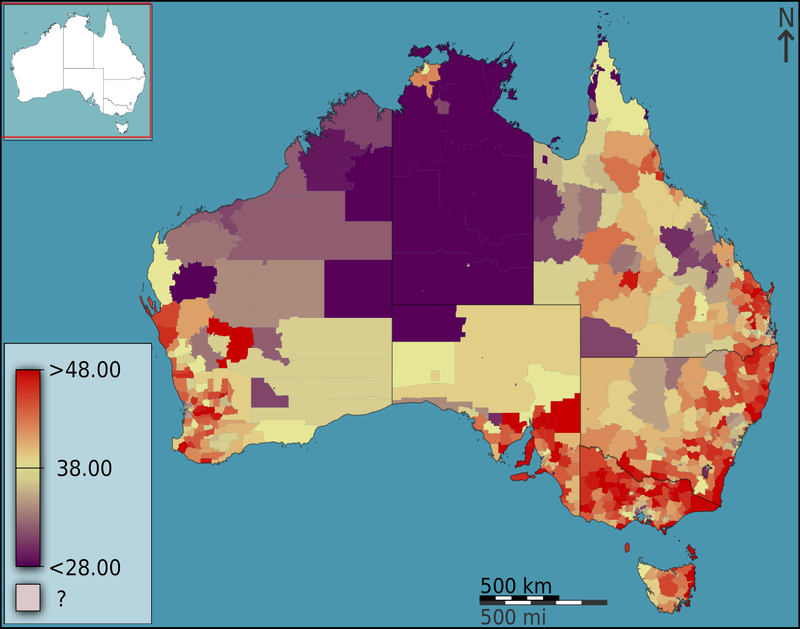 This is the average age in each Australian Land District. Australia is a country very similar to the United States, with a colonial heritage derived from the British Empire that started on a vast, untamed continent, with an even more untamed West and interior. The main differences are that the country is younger, and that the continent in question is a bit more inhospitable than North America was (to put it mildly). The demographics reflect that, with a pattern similar to the United States’, but more extreme. The giant Great Victoria and Gibson Deserts have extremely young populations, just like the American Mountain West and Alaska do, as does the relatively unpopulated Northern Territory. The older, major coastal cities and their sprawls, Gold Coast, Brisbane, Newcastle, Sydney, Canberra, and Melbourne, make a line along the country’s southeast coast that fills the area with an older population, just like the American Northeast Corridor. Additional splotches of red surround the other large cities, Adelaide and Perth. You can see the trends developing that in a few more decades will make Australia’s age map will look a lot like ours does now as the continent fills-in with more people,. So this is where we were around 50 years ago. Where will we be 50 years from now? Weren’t expecting that, were you? Croatia is a prime example of where the US is going in regards to aging, as it’s a very developed European country, but not as extreme an example as countries in Western and Northern Europe, thanks mostly to the relatively recent wars in the region. As you can see, even the youngest areas bottom out at an average of around 35 years, with huge swaths of the country averaging in the mid-50s in age. This is where we are going, as our health improves, and our lives get longer, and our birth rate slows. Essentially, while we still think of ourselves in terms of our cultural and political competitors, like Russia, China and Brazil, we’re actually slowly turning into the United Kingdom and Japan in terms of demographics. It will be extremely interesting to see how that affects our character as a country moving forward. Categories: Facts, General, History | Tags: Adelaide, Africa, age, ageing, aging, America, Asia, Australia, birth control, Brazil, Brisbane, Canberra, China, counties, countries, country, county, Croatia, demographic, demographics, developed world, developing, development, Europe, facts, florida, Gold Coast, Japan, Land District, Land Districts, Maine, map, maps, Melbourne, Mountain West, New England, Newcastle, North America, Northeast Corridor, Northern Europe, Northern Territory, Pennsylvania, Perth, population, Russia, state, states, statistics, Sumter County, Sydney, United Kingdom, United States, wars, Western Europe | Permalink.